Looking to rent a hydraulic power unit for emission-free excavator operation in Rochester, Ithaca and Upstate NY? The Duke Company rents the Wacker Neuson HPU8 (Hydraulic Power Unit) that enables dual power operation for compact excavators. This electric-hydraulic generator is manufactured for the operation of compact excavators indoors. Notably, once the excavators exits the indoor space, the generator can continue to be operated in electric mode; or alternatively, diesel operation can be re-commenced. Zero Emission drive system for work indoors or environmentally sensitive projects. 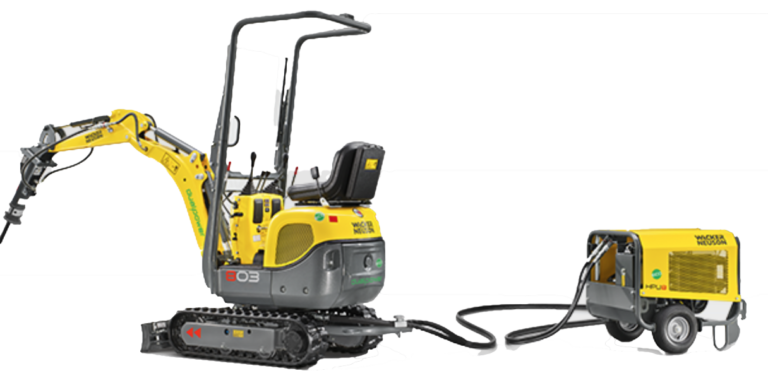 Easy to transport and connects to compact excavator under-carriage easily. Hose length: 12 meters offers 360 degree operating perfomrance. Hydraulic System – Flow Rate: 20 I / Min.